OverTime is a popular restaurant in Kuala Lumpur known for its fresh Stärker beer, live music and innovative menu, and it has brought the same formula to Singapore. Located at a quaint spot at Dempsey Hill, OverTime offer a spread of Western meets Asian favourite such as their 33 varieties of fusion skewers. The menu also consist of several Asian influenced dishes such as honey char siew, thai style chicken wings, crayfish yi mien, beef udon and lamb satay. I was brought here by Fly Entertainment artiste Benjamin Heng, who just finished filming Zombiepura. A former eatery-owner and food show host who really loves food (but is so enviously skinny), he strongly recommeded their signature Platter A. 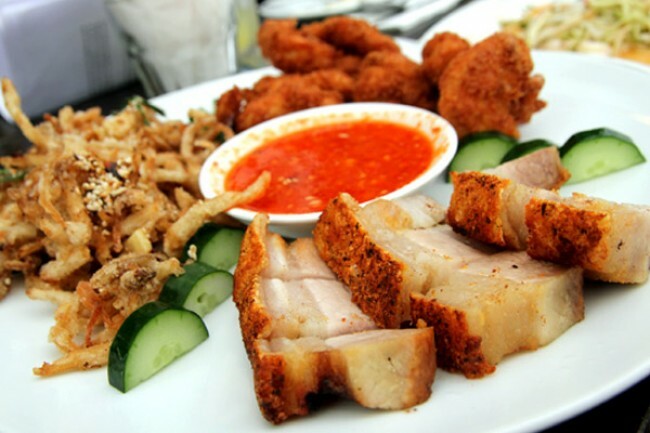 This signature Platter A ($23) consist of crunchy pork, crispy fish fillet, and cripsy mushrooms. It is rather atypical to see ‘siok bak’ in a pub menu. And the roast pork rubbed with fresh spices and basted with pan juices do make a good pairing with its fresh Stärker beer.